← Where is Your Keilah? This past weekend, our church held its third annual all-church retreat at a conference center in the mountains near San Diego. 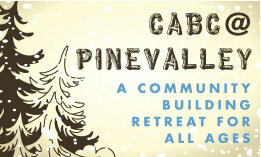 CABC@PineValley, as the retreat is known, is designed to bring all ages of the church together for a weekend immersion experience in community-building. About half of our church attended this year and by all accounts, everybody had a blast. Along with several large group meetings, there were numerous optional activities that people could sign up for. On Saturday afternoon, I led one of them called “Cross-Generational Connect,” an opportunity for young people and older people to intentionally connect with each other. About 20 people showed up between the ages of 17 and 75—a good turnout considering that there were plenty of other fun things to do at the same time. Essentially, what we did was a modified version of speed dating. I began by asking everyone to line up by age—from youngest to oldest. I gave the older folks permission to lie about their age if they considered themselves younger than they actually were. After they were lined up, I divided the group in half so that we had two groups: the youngsters and the oldsters. We then formed two concentric circles in chairs facing each other, with the youngsters on the inside circle and the oldsters on the outside circle. I gave each person a list of suggested questions and told them they had five minutes to introduce themselves to the person they were seated across from and find out some things about them that they didn’t know. After five to seven minutes, the conversations would stop and the inner circle (the youngsters) would rotate one seat to the right. This was repeated for about an hour, which allowed everyone a chance to talk to each other. This was true generations ago and it’s even more true today. This entry was posted in College Avenue Baptist Church, Ministry and tagged College Avenue Baptist Church, intergenerational, Ministry, Teenagers, youth ministry. Bookmark the permalink.